NASHVILLE, Tenn. – YWCA Nashville & Middle Tennessee’s Family Literacy Center (FLC) celebrated the success of 57 students on Saturday, June 9. The graduates range in age from 18 to 66-years old and even featured a father and son duo who earned perfect scores in several sections of the challenging HiSET (formerly GED) exam. The students were recognized at an official graduation ceremony on the campus of Trevecca Nazarene University. Students graduating from the program represent the fabric of the Nashville community. They arrived at the FLC from Qatar, Nigeria, Somalia, Egypt, Bosnia and Herzegovina, Colombia, Honduras, and Mexico. Nashville’s Hispanic Family Foundation is a key community partner, and several HFF students were represented at the graduation. The nonprofit’s interim executive director and District 31 Metro Nashville Councilman Fabian Bedne was a featured speaker, addressing students and families in Spanish. 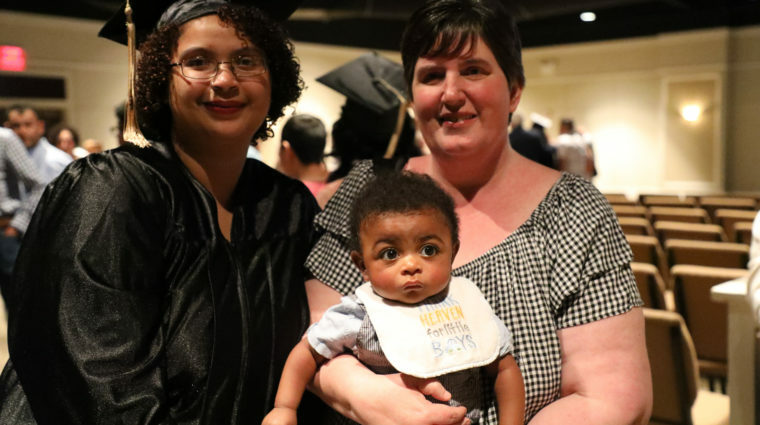 The graduates overcame numerous challenges, including language barriers and teenage pregnancy, to successfully pass the HiSET (formerly GED), and earn their High School Equivalency Diplomas. Eighteen-year old Serrell Green dropped out of high school but signed up for the YWCA’s adult education classes. “I really have a sense of accomplishment,” said Green. “The FLC staff worked with my schedule. They were constantly in touch and supportive. Life hasn’t always been easy, but today I’ve made myself and my mom very proud.” Green plans to attend college and nursing school in the fall. The graduates heard from keynote and motivational speaker Derek Young, president of YMG Enterprises, LLC. “All accomplishment starts with vision,” Young said. “Today, you are the American Dream. You have discovered the secrets of success.” He urged them to continue their hard work. Nearly 100,000 adults in Metro Nashville do not have a high school diploma. The Nashville Adult Literacy Council reports that 20 percent of adults in Davidson County are functionally illiterate. Individuals who pass the HiSET can receive higher wages, better job opportunities, and access to higher education. The YWCA’s Family Literacy Center offers high quality, culturally sensitive, comprehensive family-centered programming to help families break the cycle of intergenerational poverty and illiteracy. The FLC focuses on community-based early childhood education, parent-child learning time, parenting education, adult literacy, career services and continuing education support for families. FLC is supported through generous funders, including Dollar General Literacy Foundation and United Way of Metropolitan Nashville. Our program partners include Catholic Charities, Hispanic Family Foundation, Metro Nashville Public Schools, Nashville Adult Literacy Council, Nashville Public Library, Randstad, Vanderbilt University Medical Center, and Workforce Essentials. For 120 years, YWCA Nashville & Middle Tennessee has helped women, girls and families in Nashville and Middle Tennessee build safer, more self-sufficient lives. YWCA is dedicated to eliminating racism, empowering women and promoting peace, justice, freedom and dignity for all. Programs include Domestic Violence Services, Girls Inc., AMEND Together, Dress for Success and the Family Literacy Center. For more information, visit https://ywcanashville.com, follow us on twitter @YWCANashville and find us on Facebook facebook.com/YWCANashville.